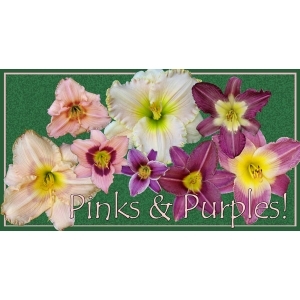 Pink and purple daylilies are some of the most popular at our farm and they sell out regularly! This collection offers you a beautiful variety in shades of pink and purple and in various sizes to add to your own garden. The package includes 2 fans of each of the following plants (total of 16 fans! ): Belle Cook, Sophisticated Miss, Nairobi Night, Olive Bailey Langdon, Little Missy, Doge of Venice, Angel Artistry, and Little Monica. Don’t wait as quantities are truly limited to what’s in the field!